Mayor William Hale Thompson celebrated his 51st birthday on May 14, 1920. 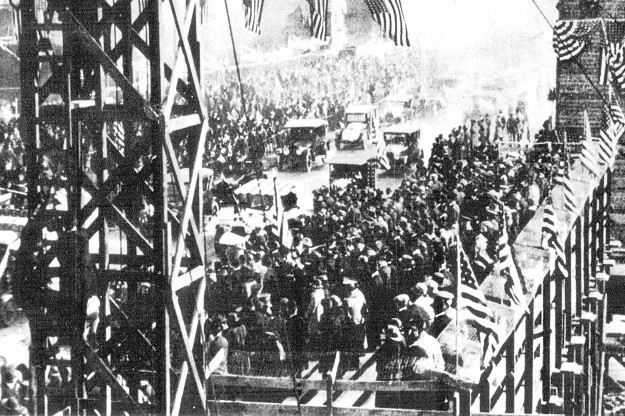 He marked the occasion by dedicating the new Michigan Avenue Bridge. Now, that was something worth celebrating–and Chicago did. 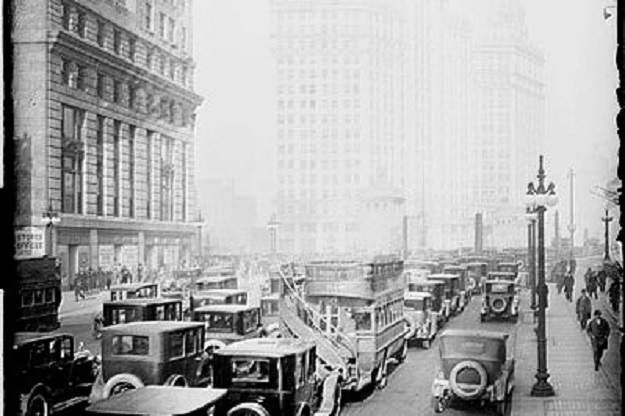 Michigan Avenue had always been a South Side street. It ended at the south bank of the Chicago River. If you wanted to cross over to the North Side, you had to go a block west to Rush Street. North of the river, there was no Magnificent Mile. In the early 1900s this part of the city was an area of factories and scruffy rooming houses. Instead of wide, beautiful, bustling North Michigan Avenue, there was narrow little Pine Street. But the three rules of real estate are: (1) location, (2) location, (3) location. Here was a large tract of under-developed land close to the central business district. Burnham’s 1909 Plan of Chicago proposed building a bridge connecting Pine Street with Michigan Avenue. The city was eager to spur development north of the river. In 1917 Edward Bennett was hired as architect and began work on the “link bridge.” He based his design on the famous Pont Alexandre III in Paris. Bennett’s Michigan Avenue Bridge was actually two parallel bridges that operated independently. The main span was 220 feet long and double-decked. All commercial traffic was exiled to the lower level. Later, the city planned to build connecting double-decked highways along both banks of the river. At 4 p.m. on dedication day, Mayor Thompson and city officials climbed into cars at Congress Plaza, and led a motorcade up Michigan Avenue. They stopped at the new bridge. The mayor got out of his car, said a few words, then cut the red-white-and-blue ribbon that hung across the roadway. That was the signal. Airplanes suddenly appeared overhead and “bombed” the bridge with confetti. A calliope pumped out rousing tunes. People cheered. The mayor waved at the crowd. Then he got back into the car and the motorcade continued. Four thousand cars followed Thompson over the new bridge. They represented business concerns, motor clubs, political organizations and everyday citizens. After a leisurely tour of the city’s boulevard system, the parade dispersed. That evening a fireworks display concluded the day’s events. With the opening of the bridge, Pine Street was widened and became the northern part of Michigan Avenue. The Wrigley Building followed, and the Tribune Tower, and everything else.